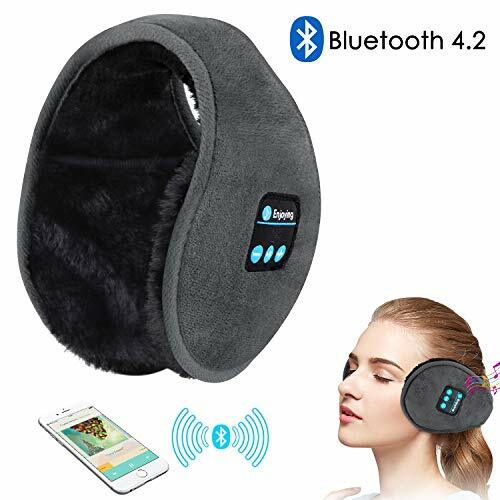 ☛【Bluetooth 4.2 & 8 Hours PLay Time】This Bluetooth Earmuffs Headphones adopts bluetooth 4.2 technology, wireless range up to 33 feet, making transfer faster and your privacy more security. Built-in 200mAh high-performance battery, Charge via USB Cable. Charge about 2 hours can provide 8 hours playing time. Bluetooth can match device easily. It connect cellphone, tablet,laptop, tv, dvd via Bluetooth in your device setting. ☛【90-day Money Back Guarantee】Once you buy the bluetooth music earmuffs from our store, if you are not satisfied with the bag within 90 days,we promise to give you refund. ☛【Comfortable Material and Washable】Our ear defenders is made of high-quality polyester and fleece fabric ,which can keep you warm and comfortable on winter. And it is washable.before washing,pls take out the inner bluetooth module. ☛【Best Gifts For Christmas or Winter】- This earmuffs headsets not only protect against your ears on chilly days and keep warm,also release your hands when you are doing outdoor sports.such as Running,Riding,Skiing,Skating,Hikinggym,Playing Snowball,Yoga,exercise,fitness.Or read audiobooks/youtube channel on plane/train journeys. It is the best gifts for your family or friends.